BECKER, Minn. (AP) -- Four decades ago, watching a peregrine falcon soaring through the sky east of the Mississippi River wasn't possible. The fast-flying raptors hovered on the brink of extinction after widespread use of the pesticide DDT reduced their ability to produce viable eggs. By the 1960s, the peregrine population had declined to roughly a dozen pairs in the western United States. That history made the rain-soaked scene at the Sherco power plant earlier this month even more remarkable, the St. Cloud Times reported. A group of schoolchildren watched through a telescope as Brian Schmidt removed four fuzzy, whitish-gray chicks from a nest box 450 feet up the smokestack and brought them down to the ground to be banded. "Just seeing four peregrines right now is a pretty big success story," said Schmidt, an environmental analyst with Xcel Energy, which owns the Sherco plant. Peregrine falcons made a dramatic recovery after DDT was banned in 1973. A captive breeding and release program helped increase their numbers, and they were removed from the endangered species list in 1999. There are now between 2,000 and 3,000 nesting pairs in North America, according to the U.S. Fish and Wildlife Service. About 25 years ago, Xcel began putting nest boxes on its power plant stacks. The first nest box was installed in 1990 on the Allen S. King Plant in Oak Park Heights. Since then, the program has been copied by other power plants worldwide. The boxes are installed 300 to 600 feet above the ground to imitate the high cliffs where peregrine falcons prefer to nest and perch. Webcams offer the public views of the eggs and, after about 33 days of incubation, the chicks hatched. Xcel has falcon cams on two other Minnesota power plants, including the King plant and Black Dog in Burnsville. 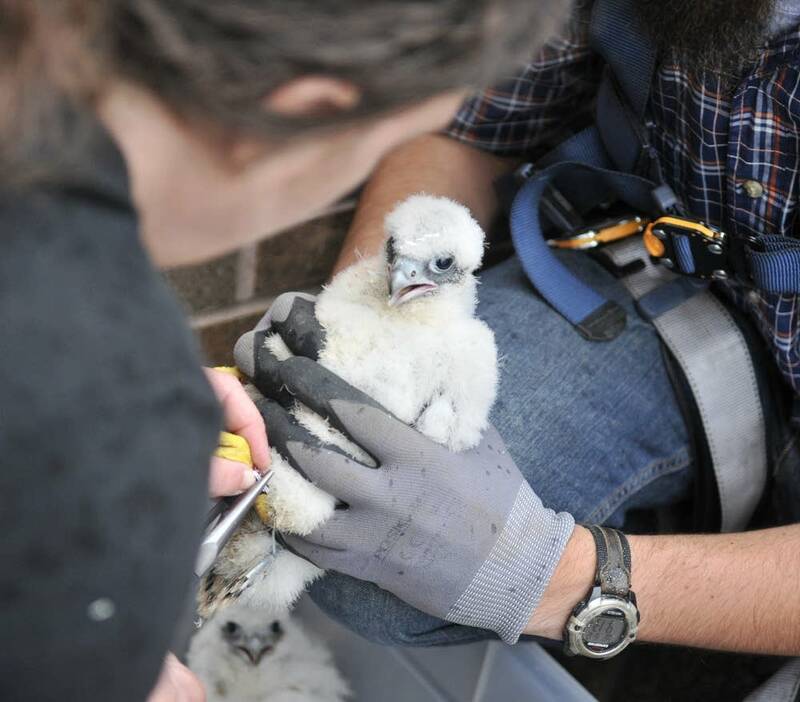 Xcel partners with the nonprofit Raptor Resource Project to place bands on the legs of the newly hatched chicks. Each band bears a number that can be spotted through binoculars, said Amy Ries, the project's administrator. The number can be used to track the bird's location and lineage. "Now we have this whole population of birds that we have a lot of data about," Ries said. As rain pelted the onlookers, Schmidt carefully scooped up one of the fuzz-covered chicks, known as an eyas, and held it still while Ries attached the metal band to its leg just above its curled yellow talon. The eyas made a high-pitched squawking in protest of the handling. Judging from their size, legs and voice, Ries identified three of the chicks as male and one as female. The females are larger, have lower-pitched squawks and thicker legs, she said. Banding doesn't hurt the chicks, Ries said. Their legs grow first and are nearly adult size when they're banded, so they won't become too tight and restrictive. The chicks are just starting to grow their wing and tail feathers. They will be able to fly about 40 days after hatching. Peregrine falcons generally feed on other birds, dive-bombing them at speeds of more than 200 mph and catching them mid-flight. The cold, wet spring has been a difficult one for the falcons, and the number of surviving chicks was lower than usual, Ries said. An image from the Sherco webcam in April showed the female trying to keep her eggs from freezing in the snow. Some eggs at the other power plants didn't hatch, and some chicks at the Black Dog plant died from a parasite, Ries said. "This is real nice to see them looking so wonderfully healthy," she said. A group of fourth-graders from Becker Intermediate School watched along with their teacher, Caroline Olsen, a reading specialist. Olsen said the students had read about peregrine falcons and watched the chicks on the falcon cam. They'd even picked out names: Rocky, Jet, Flame and Oreo. The students were able to watch the banding process up close and even touch the chicks. "It gets them involved," Ries said. "It lets them know you can make a difference."